Here’s a rare, and last minute, Spotted post. I just came across this ebay. It’s a 1987 Toyota Land Cruiser 70-series, 2-door, diesel in LX trim. The 70-series was, and is, a highly capable branch of the Land Cruiser family tree that was never imported into the US. It was so capable, in fact, that Scott Brady chose the 4-door 70-series for his Expeditions 7 around the world trip. The seller doesn’t state where this one started it’s life. Canada is my guess, given that the mileage is in kilometers but the steering is on the left. The mileage is getting up there at about 272k kms (169k miles), and there is a bit of rust and the odd tear in the seat. But for someone interested in a rare, diesel, Land Cruiser, I imagine this would be quite a find. The vehicle is listed on ebay in South Carolina with a current bid of only $8,700. If you’re interested, jump on it. There are only four hours left in the auction, which currently has 32 bids. 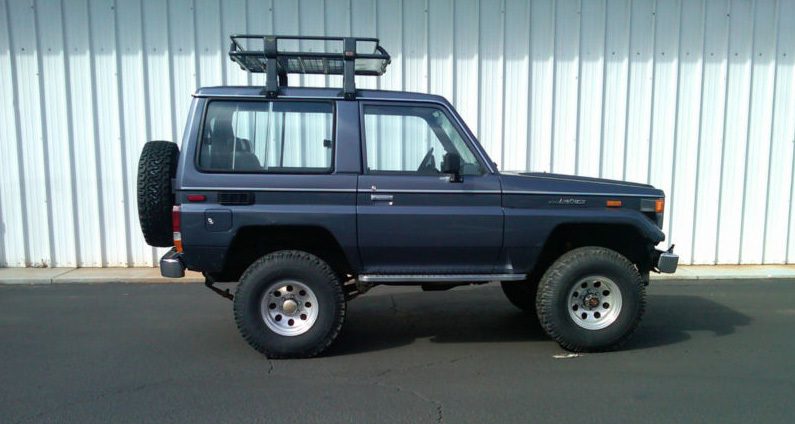 Update 2/13/2013: Bidding for this rare Land Cruiser topped out at $11,600.